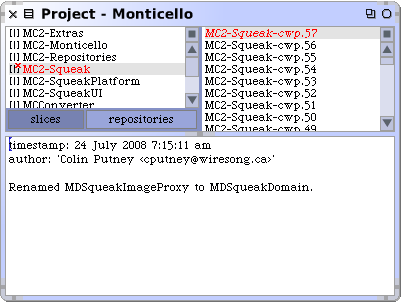 The following commands are available from the context menu of the left most pane of the project browser. Use this command to create a new project. It will prompt for the name, create a new empty project with that name. Use this command to focus on a particular project. It will open a new browser without a project pane, showing only the contents of the selected project. Use this command to delete projects that are no longer needed. Any in-memory repositories that are part of the project will be garbage-collected, but the contents of external repositories such a files will be preserved. The Smalltalk code that is part of the project will not be affected.